I originally wrote this review in late summer 2010. Obviously, the sentence that starts "about six months ago" is no longer accurate, but the rest is still worthwhile. About six months ago, I got a new Vestax PMC-580Pro as a warranty replacement for my broken PMC-CX. I got a couple requests for a user review after I'd had a chance to put it through it's paces, so here it is. For starters, if you haven't read it yet, I suggest you check out Deft's review of the 580 on Skratchworx. It's right on the money, and Gizmo's pics are much better than anything I could pull off. While you're there, click a few of the ads and help the Skratchworx guys pay their hosting bills. In my review, I'll be expanding on Deft's review and covering real-world usage situations. The PMC-580Pro is a 12" format digital 24-bit/48kHz four-channel club style mixer with linear channel faders, powered by five DSP chips. It's the same width as the Xone:92 and the Pioneer DJM-800, but 1.75" longer from front to back, partly due to the front panel fader curve adjustment knobs. The upfaders were far too stiff for my taste, but Vestax thoughtfully placed two small circle cutouts at the top and bottom of each felt dust-guard, so it's very easy to put the straw from a can of Faderlube in there and smooth out the faders a lot without disassembling the mixer. Most of the knobs on the mixer are black and have a rubberized coating, which makes them extremely easy to use, but Vestax made the puzzling (possibly aesthetic) choice to use a silver plastic knob with a slick finish on the rotary selector switch on the main effects section, which is the most difficult to turn control on the mixer. I found that replacing the silver knob with a black rubberized one made the master effects selector switch much easier to grip and turn. The PMC-580Pro uses the same massive power supply used by the PMC-500, PMC-CX, PMC-08Pro, and R-3. The connection at the back of the mixer features a screw-on locking ring, which prevents the power cord from being pulled out, a very nice feature. The size of the PMC-580Pro makes finding a road case a difficult task. The only case I could find that fit was the Marathon MA-12MIXBLK* series, and it's a close fit at that, with no room left over for for cables or the massive power supply. The overall appearance of the mixer in a dim environment is very nice, most of the LED indicators are bright enough to see without being overly bright or distracting. The number block displays for the time and BPM readouts on the master effects section are noticeably brighter than everything else on the mixer, a little too bright. 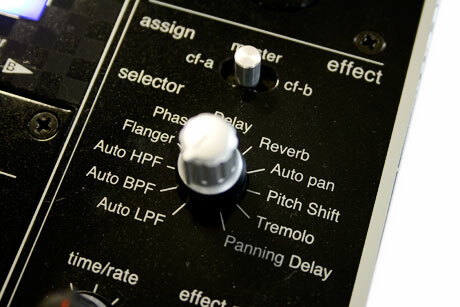 The EQ section is spacious and easy to use. The club-style features (headphone & booth EQs, booth source from cue or master, mono switches) make the PMC-580Pro flexible and easy to use in a variety of environments. -The phono inputs are not switchable to line. -S/PDIF inputs are only provided for channels two and three, there's no good reason not to have them on all four channels. -No matrix inputs. 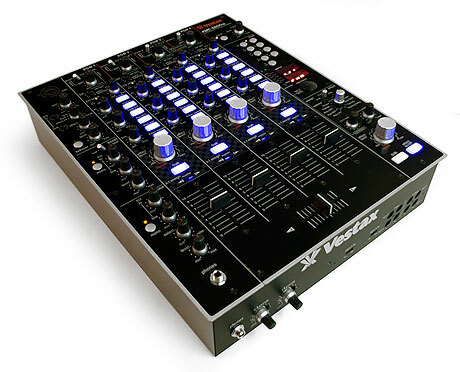 One of the best DJ mixer features ever released by Vestax is inexplicably not included on their top-of-the-line club mixer. -No cut-in controls for the crossfader. I've played on a lot of different mixers over the course of my DJ career, and the PMC-580Pro is without doubt my favorite so far. It's a bit spendy, but you get an awful lot for the money.